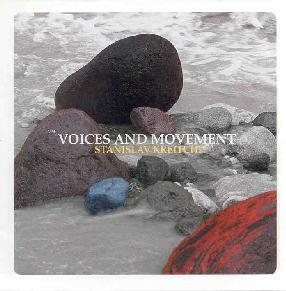 Stanislav Kreitchi - "Voices And Movement"
Stanislav Kreitchi's follow up to 2000's Ansiana release features more of his captivating constructions using the ANS synthesizer, keyboards, ovaloid (a stringed instrument) and various collages of sounds and voices. Kreitchi excels at combining tripped out spacey sounds and avant-garde concoctions with voices and natural elements to create music and sound sculptures that are sometimes collage-like in nature and at other times image inducing and atmospheric. "Rhapsody In Rorschach" is an 18 minute experience in which we are presented with multiple aural ink stains to interpret as our minds please. The piece opens and closes with droning chants, didgeridoo sounds and pulsating space waves. This soon shifts to an avant sound pastiche of percussive electro clatter and bangs, some of which sounds like chains rattling, and surely the ovaloid is producing the raking across the radiator sounds. We also hear spacey chamber music with an eerie child-like feel. My favorite part is the spacey sound collage and jazz themed sequence. Kreitchi transitions through more themes than I could count though each sequence moves seamlessly into the next. The space factor is high, the sound constructions creative, and there's lots of experimentation without becoming overly abstract. A fun experience that reveals new discoveries with subsequent listens. "Four Fantasies" is a 4 part suite that explores each of the seasons. Kreitchi works heavily with natural sounds to develop his themes. On "Winter" we hear howling winds and crying wolves... I could almost feel the cold. It includes both darkness and a strangely peaceful serenity. "Spring" treats us to flowing streams, birds chirping and cacophonous water droplets bouncing around. "Summer" beautifully reproduces the sounds of nature. And "Autumn" is another cold and dark themed piece with its ghostly howls across a windswept plain. I felt like I was in another dimension, or deathly place, or even limbo perhaps. A recurring theme across all four seasons is a song portion that sounds like traditional Russian folk singing. Kreitchi rounds out the set with the aptly titled "Voices & Movements" and "Ruins In The Waste", an avant-garde orchestral piece with an elusive complexity that required closer and more repeated listens than the other tracks. In summary, Stanislav Kreitchi has once again produced a fascinating electroacoustic listening experience that creatively combines natural and sculpted sounds to compose a work that will reward listeners will repeated listens.